Foreigners cannot legally own land in the Philippines. However, they can own other properties. 1. 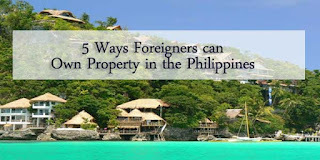 Foreigners (Non- Philippine citizens) can own houses or buildings in the Philippines, but they cannot own the land where their buildings or houses are built. They can rent the land/ lot where their building or house is built. 2. Foreigners can own condominium units in the Philippines as long as foreigners don’t own more than 40% of the condominium building. 3. Foreigners can form a company with Filipinos and that company can own properties in the Philippines. The company must have a minimum of 5 shareholders and Filipinos must consist 60% of the shareholders. 4. Foreigners or foreign corporations can lease land in the Philippines on a long-term contract involving a 50-year initial period, which is renewable every 25 years. 5. Natural born former Philippine citizens can own a maximum of 5000 square meters of urban land and 3 hectares of agricultural land in the Philippines. 4. Income tax on rent of 5.13%, along with other fees.